This organism is commonly isolated in soil and produces antibiotics such as bacitracin, subtilisin, and mycobacillin. It's gram stain is positive, and its spores are centrally located. Ordering information: This organism is offered as a ready-to-use tube culture as well as in a freeze-dried culture for longer storage. 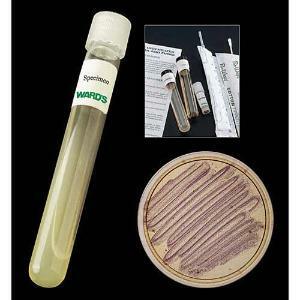 Freeze-dried organisms come with everything you need to rehydrate and culture the organism when you're ready. Caution: Caution:Though this organism is not considered to be pathogenic, Ward's recommends that you utilize proper aseptic technique when handling all microorganisms.